The Queen Mary embarks on its Halloween 2013 oceanic voyage of terror. Does it crash onto the shadowy reefs of the Dark Harbor, or tie the competition in Knotts? To find out, read on...if you dare! Since rebranding its annual Halloween attraction in 2010, the Queen Mary Dark Harbor has been sailing into ever deeper waters, gradually making good on its promise to become not merely a short cruise but an actual tourist destination - a place to stop and stay, even after completing the maze tours, imbibing the foetid atmosphere of salt and brine, laced with the ectoplasmic residue of souls submerged beneath the waves. Halloween 2013 sees the venerable haunted ship navigating even further through fog-enshrouded seas while maintaining the same steady speed. Progress is slow; the course wanders slightly off the charts (into unmapped areas marked "Here there be clowns"), and runs aground on occasional shoals that leave you wondering whether the captain is at the helm. Nevertheless, the nautical excursion is worth taking, its course corrections leading to a few frightful sights s not seen on the previous itinerary. A tour through Dark Harbor reveals much that is familiar from Halloween 2012: a more wide-open layout; more appetizing food options; a convivial "RIP" lounge; and five returning mazes: DeadRise and Village of the Damned (on land) and Submerged, Hellfire, and Containment (on board the Queen Mary). New for Halloween 2013 are The Circus Maze and its mascot character, The Ringmaster. The circus them extends throughout the park, which is essentially one large scare zone, populated by creepy clowns. New rides (the Rockoplane and the the Zipline) and new attractions (the Freak Shows - more on which later) augment the carnivalesque ambiance. There is, once again, a stage from which live music emanates. You may also see a dramatic presentation, in which the Ringmaster recounts the histories of the ghosts aboard the Queen Mary, while costumed characters "act" the roles: the acting consists mostly of walking around the stage while the Ringmaster narrates. The show serves well enough as an introduction to the back story of the characters one will meet inside the mazes, but we were less impressed with the story-telling than with the ghoulish violinist who provided live solo accompaniment. Our question, of course, is: Why clowns? * The theme is overly generic - in no way related to the nautical setting of the haunt. Veering into these, the Queen Mary steers clear of its strengths - its own haunted history and the vast depths of potential inherent in what lies hidden beneath the ocean's surface - and pulls straight into the least interesting port imaginable. That having been said, we must admit that the carnival theme does not totally run the ship aground. The Circus maze (located inside the Dome) is actually quite good. We can't quite explain it, but in spite of our distaste for the over-used psycho-circus them, we found ourselves having a good time under the big top, laughing and screaming until we emerged. Some aspects of The Cage (which was in the Dome the previous two Halloweens) are still incorporated. In between the circus acts, you must navigate dark passages, bedecked with long black curtains that obscure the, making it difficult if not impossible to find a way out. The maze-like feel is augmented by the fearful unease of not knowing what - if anything - might be lurking in the shadows. On top of that, the clown-theme layover offers a nice level of additional interest - not enough to make The Circus a must-see, but it is better than we expected. Perhaps this girl and Headless Hannah could come to some equitable arrangement. These five attractions turn out to be the unexpected highlight of Dark Harbor 2013. Unfortunately, the monikers (such as Headless Hannah, the Human Crab) are misleading - suggesting that you will gawk at some masked monstrosity or at a ghoulish piece of taxidermy. This confusion may lead many unsuspecting visitors to circumvent The Freak Shows ( especially since they require an additional fee of$5). This would be a sad mistake. The Freak Shows are actually mini-mazes - roughly akin to the Skeleton Key rooms at the 2013 Knotts Berry Farm Halloween Haunt (reviewed here). Visitors are allowed to enter the corrugated metal corridors only in small groups, so that whatever lurks inside is ready to scare you, your friends - and no one else. The first couple are relatively short, but as you move from right to left, the Freak Shows increase their intensity. Headless Hannah and The Human Crab offer single scares at the end of single corridors: the first is mechanical; the second is a live actor. Sparky is also short in distance but offers an opportunity to stay as long as you like: the titular freak is actually a talking skeleton, a would-be stand-up comedian who engages you in a personal dialogue for as long as you would like to trade barbs. And watch out: the name "Sparky" may have something to do with static electricity, if you should happen to touch the rail separating you from the skeletal jokester. The appeal of both The White Ghost and The Shadow Spirit lies in visibility - or the lack thereof. The first is white with fog; the later is dark with shadows. Both leave you wandering blind, feeling for the walls, searching for a way out, and possibly wandering in circles. Worst of all, the titular characters lurk inside, mostly invisible, but making startling and unexpected appearances. You may frequently feel lost in uncharted waters in these two mini-mazes - which are actually not that much longer than the other three Freak Shows, but certainly seem to be - so expect to spend a little time navigating your way out. We missed Half-Hatch Henry in Hellfire. We found the returning mazes mostly up to their old standards, which are high if not always outstanding. If we noticed any overall difference (and this may be simply misperception or lapsed memory) there seemed to be more emphasis on limited visibility of the kind employed in The Circus, The White Ghost, and The Shadow Spirit - forcing visitors into darkened spaces where they stumble blindly, hoping their grasping hands come to rest on a wall, not on some dark denizen of the deep. Wait: did we say we enjoyed all the returning mazes? Well, except for Hellfire. To our dismay, when boarded the Queen Mary anticipating a quick voyage down into the infernal regions, we found ourselves stuck in another kind of hell altogether: a VIP fast-pass line that was sailing along about as quickly as a ship run aground on a sandbar. Which is to say: not at all. And it remained this way for twenty minutes before we gave up and went elsewhere. A twenty-minute wait may not seem worth complaining about, but when we left, the Queen Mary staff were still letting in even more people, and we're certain the poor folks without VIP fast passes were doomed to be waiting for hours. And not one of the staff was saying anything about it: no announcements about when the maze would start up again, not even so much as an admission that the line had not bee moving for nearly a half hour. It's not as if the haunt was particularly crowded. How much sea-sense does it take to tell the waiting customers, "We're working to get Hellfire running again. In the meantime, you could visit any of the five other maze, such as Submerged, which is right next door and has virtually no line at all"? What makes this lapse unforgivable? The exact same thing happened to us at the Queen Mary a few years ago, in the exact same location. Apparently, the staff has learned nothing in the intervening years about dealing with crowds. We know that problems inevitably occur on opening night, but the staff should not stand around acting as if all is smooth sailing, when in fact the ship is sinking. For many a Halloween season, we have booked passage on Queen Mary's annual Halloween voyage, savoring the sinister thrill of its dank, authentic atmosphere. Seldom if ever, however, have we felt an urge to relax and hang out like tourist on a cruise; typically, we went through the mazes as quickly as possible, and then disemarked. In 2013, we finally find ourselves tempted to sit down and enjoy the culinary possibilities of the open food court or to take advantage of the RIP Lounge. We will even admit that the carnival theme (though not conducive to good haunting) engenders a convivial atmosphere that invites a prolonged sojourn. Dark Harbor deserves a spirited round of applause for its attempts to overcome the conga-line approach to mazes seen in most Halloween theme park attractions. Even with their sparse decorations and obvious scare-strategies, the Freak Show mini-mazes provide a more up-close-and-personal brand of Halloween horror, such as you would normally find only in a smaller venue. We hope the Queen Mary proceeds at full power with this idea, but drops the misleading "Freak Show" title, which is clearly intended to tie in with the misguided circus theme. Instead, rebrand the attractions with a more nautical name. Davey Jones' Lockers sounds a bit corny, but we're sure there must be something better. On the same note, burn the circus tent and send the clowns to the deepest depths of the most malevolent maelstrom. The Dark Harbor should be a home for sea monsters and ghost ships, not for itinerant circus folk. Despite the erratic navigation this year, the ship is still making progress towards its destination. But if the haunt truly hopes to scuttle Knotts Scary Farm and Halloween Horror Nights at Universal Studios Hollywood, then Dark Harbor needs to chart its own unique course instead of veering toward more conventional ports of call. We suspect we know the answer: the Dark Harbor crew looked through their vaults, stumbled upon the circus sets from the old Queen Mary Terrrorfest (back when the event was handled by Shipwreck Productions), and decided it was financially viable to reuse available assets. 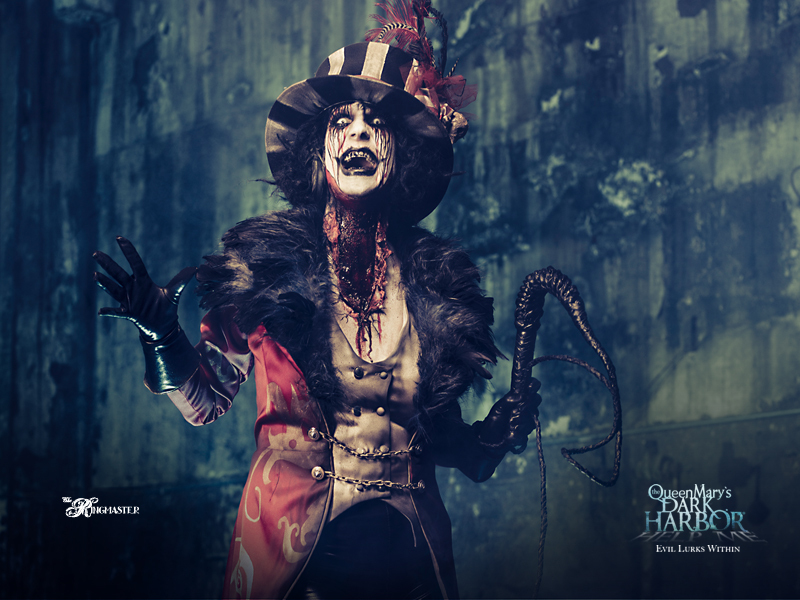 Dark Harbor continues at the Queen Mary on October 4-5, 11-13, 17-20, 24-27, 31, and Novermber 1-2; from 7pm to midnight. The addressis 1126 Queens Highway Long Beach, CA 90802 Queen Mary. Check their website for more info, or call 562-435-3511. Interested in other Halloween Haunts? Find more here.